Les Tropiques campsite is a wonderful, family friendly 4 star campsite that’s set within 9 hectares of grounds on the south coast of France, which is the perfect place for a family camping holiday. This lovely traditional campsite boasts a fantastic array of facilities and activities to ensure you have a lovely family holiday. The grounds are immaculate with a range of tropical plants and flowers to not only provide a lovely atmosphere but also make you feel as if you’re in paradise. One of the best things about Les Tropiques is its location, away from the hustle and bustle of the local towns, yet within easy reach of them, should you wish to visit. Those looking to explore outside the campsite will find a variety of places to visit and things to do nearby. Perpignan lies a short distance away and if you fancy travelling a little further afield why not visit Carcassonne or cross the border into Spain which is a short drive to the south. Les Tropiques also lies just 400m from a beautiful sandy beach which is great for families as you can walk to it within a few minutes. There’s lots of space, golden sand and fantastic views from the beach so whether you want to sunbathe, swim, play or just have fun, you’re sure to have a fantastic time. At the heart of the campsite you’ll find a swimming pool complex that’s second to none in the nearby area. There are 5 swimming pools, several slides, sun terracing and a beautiful spa wellness area, all of which will ensure you have a truly fabulous holiday at Les Tropiques. 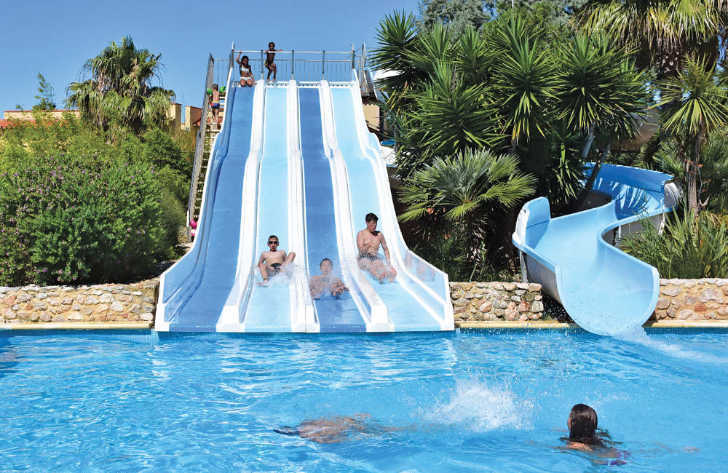 Les Tropiques campsite offers a comprehensive selection of activities and facilities on site and also nearby to ensure you have a fantastic family holiday. On-site activities at Les Tropiques campsite include table tennis, tennis, football, basketball, volleyball, running track, gym, archery, scuba diving, boules, playground and cycle hire. Facilities available at Les Tropiques campsite include WIFI, restaurant, takeaway, pizzeria, bar, groceries, games room, tv room, animation team, washers and dryers. Accommodation at Les Tropiques campsite includes a range of 2 and 3 bedroom mobile homes that are available from Eurocamp.